Although multi-tasking has gotten a bad rap lately, writing this post for smartstuff Furniture’s Social Station has been indisputably fruitful. As one of six designers they have tapped to share trends in kid-focused DIY and decorating, this honor translates to creating and crafting with my family and friends for “work”. Education innovator Maria Montessori asserted “PLAY is the work of a child” but in this case, play is the work of a lucky mom-deisgner too. I’m always fussing at my kids, “Get off the screen!” whether it’s the iPad, phone or TV. “We’re bored” they cry, knowing my reply will be, “I’ve never been bored IN MY LIFE.” Eyes roll. If you are a parent, I am sure you can relate. 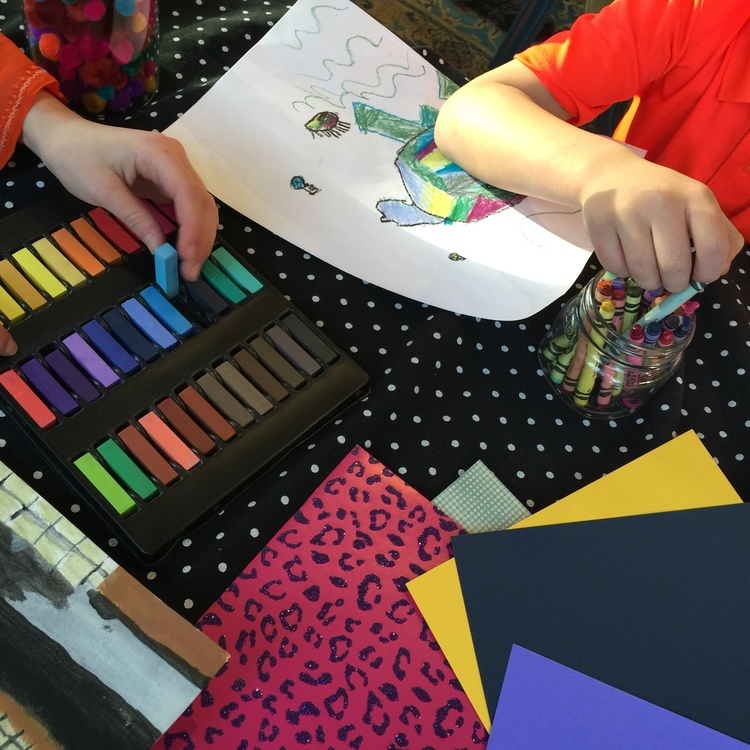 With the immediate delivery of excitement from the screen, it can be like pulling teeth to get kids to unplug and redirect them to some quiet time using their imagination: drawing, crafting, or old-fashioned playing. 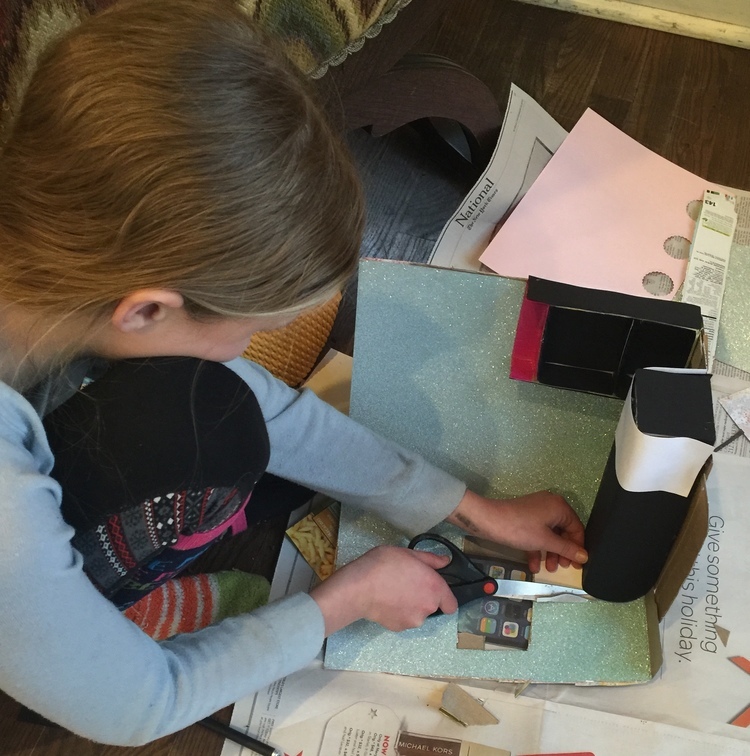 My daughter creating a room for her doll out of craft paper. 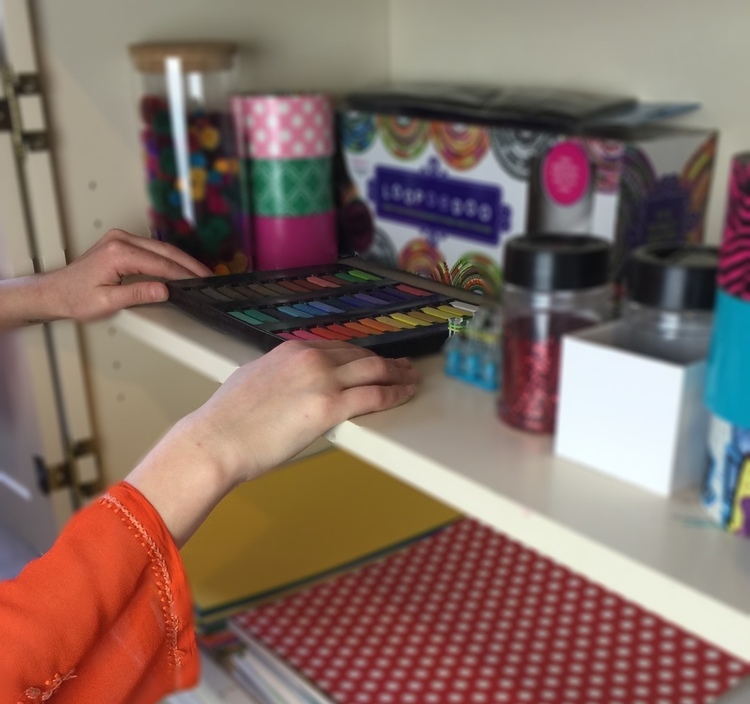 We used the KonMari method to help organize art supplies. 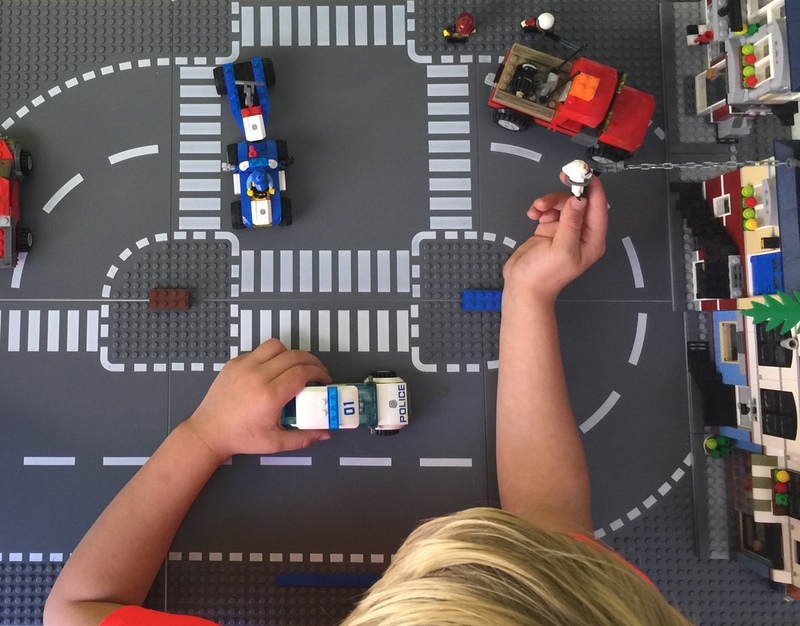 After a nudge, their first off-screen go-to is playing Legos. They can play for hours constructing their Lego town. My husband is into it too. Giovanna, my daughter, says she likes to do the interiors once Lang, my husband, does the architecture. Wilton, our son, likes building vehicles best. I love watching their progress. I also love that it’s never complete, there is always more to imagine, build, create. 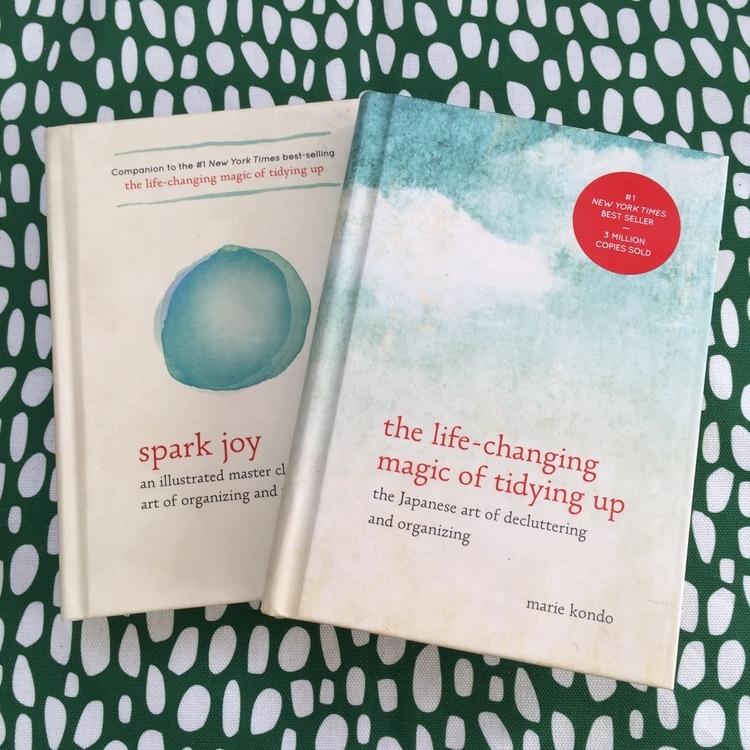 Over the holiday while they were hard at work on their Lego town, I got the chance to dive into the NY Times best seller The Life-Changing Magic of Tidying Up by Marie Kondo. Gifted to me by my husband (the neat-nik of our clan), it was a not-so-subtle hint for some organizing. Organizing our toys and Legos with the KonMari method fostered creativity. TrimQueen for smartstuff Social Station blog. First of all, the term “tidying” is much less intimidating to me than organizing or cleaning, which sound like chores. “Tidying” sounds appealing: I could picture myself “tidying” in a party dress. In essence, author Marie Kondo promotes the idea of surrounding yourself with the things you love. Contrary to my usually impulsive purging spats, Kondo professes to “Focus instead on choosing the things that inspire joy and on enjoying life according to your own standards. This is the true pleasure of tidying.” This was just the reframing I needed, although the jury was out whether it would be as life-changing as the book declared. Her KonMari Method, also illustrated in her subsequent book Spark Joy, says to start with clothes, but because we had a vacation window and I wanted to start with something communal, we started with art supplies and then toys. With the incentive of going to their movie of choice when finished, we were off. I soon realized we had stuff all over the house—pens, sketch pads, and colored paper. I found duct tape in 3 different drawers and in their bedroom desks too. Kondo says to gather it all and lay it out on the floor. Do this by CATEGORY, not location. Well, the kids were definitely up for throwing it all on the floor. We gathered from at least half a dozen drawers and shelves in the house; it was like a scavenger hunt. Once it was all amassed, I could see we had duplicates of a lot of items and it was a big chaotic mess. Even the kids were shocked and also surprised to find some things they thought were lost. In keeping with the method, we started to pull out the things we loved. It became a pretty, colorful pile, full of decorative paper, fancy scissors, good markers and, pompoms, pastels, paints and new brushes. We designated shelving in the study where it would all be kept, and separated into art supplies and craft supplies. 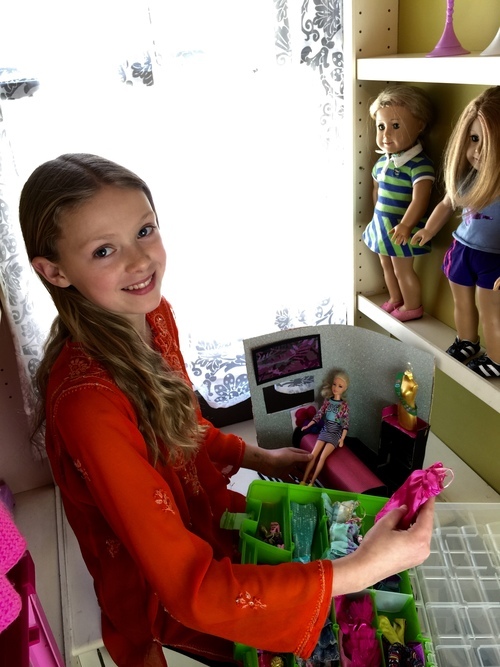 My daughter Giovanna is a crafty organizer, following YouTubers like Bethany Mota. “My room is like my brain,” she says. 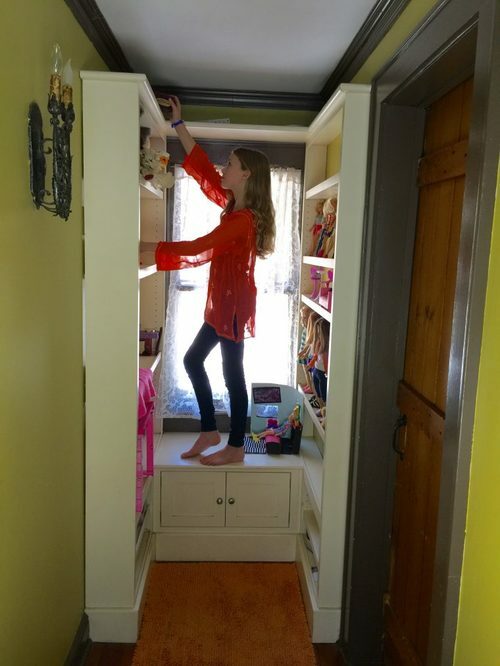 “If it’s cluttered, my brain is too.” She usually prefers organizing other peoples messes over her own but was up to the task with a movie and candy within reach. My son wanted to hold onto too much, so after he put stuff away, I sneaked the dupes into the donation box. So what really is the point of this tidying craze? Personally, I am feeling the effects, and whether or not the children realize it, they do too. Wilton’s energy is more focused on his creative drawing, when he isn’t digging around for the right colored pencil. When Giovanna has her dolls neatly displayed, she enjoys playing with them more, and takes better care of the ones she loves. The kids may still need a gentle nudge to get off their screens, but they are definitely more likely to be creative with the “finding” hurdle removed. As for me, working with my edited possessions has made me happier. Choosing my favorite pairs of shoes that still spark joy —and donating 30 pairs that may do the same for someone else—I free myself of the morning mental banter that was keeping me from starting the day clear-headed. I believe this clarity is impacting the ease and flow of my creative work. Tidy by category says Marie Kondo. Donating 30 pairs from my helps me start the day with a clarity. What treat did they choose as their reward? In the end, they wanted to stay in. We all snuggled on the sofa, in our (tidied) home, watching a family flick. It was a treat for me too, in more ways than one.